Gain a deep understanding of the powerful GRPI model. Learn how to use GRPI as a tool for project management, team development, personal development and more. Explore the GRPI model in a series of interactive business simulations. Participate in a brainstorming session using one of your own current business challenges using the GRPI model as a guide. The GRPI model is a tool used by teams to increase the effectiveness of their team development, for better project management and many other areas. Developed by Richard Beckhard, the GRPI tool is simple enough to be memorable with enough depth to be useful again and again in a variety of situations. If your team is lost in the weeds, the GRPI model helps team members reconnect with a common purpose and realign with what’s most important for you all. Quixote Consulting uses action learning to explore the GRPI model with a series of engaging multi-round team building activities. These team building activities allow teams to go down the GRPI checklist and self-assess their performance. Each of these team building activities is collaborative, with multiple rounds to help teams improve their performance using the GRPI model. All of the activities are also perfect for systems thinking and six sigma ‘lean’ team building. Get a GRPI on your team’s development and go from ‘Good to GRPI’ on the next project your team manages! Some examples of action learning business simulations the GRPI model can be explored experientially are below. In this multi-round activity, the group is separated into smaller groups and given a task: deliver a maximum number of balls into specific buckets within strict time deadlines in the midst of a rapidly changing environment. As the activity progresses, the participants find that they must challenge their own assumptions about competition, problem solving, and “the way it’s always been done,” in order to reach their goals. Innovation, team collaboration and team communication skills are honed in our most popular collaborative team building activity! You have some of the information but can you communicate what you know? Who will see the big picture? Each person gets images that are part of a larger sequence. Together the group must decipher the sequence and get the images laid out in order without any person seeing anyone else’s images while the clock ticks! Will the group see the big picture in time or will they get bogged down in details…or worse yet, fail to notice a crucial part of the image in time? This complex verbal communication skill builder has a powerful “aha” factor that makes the grand unveiling unforgettable! This puzzling challenge requires the whole group to collaborate and communicate – quickly. Twenty five pieces link in innovative ways. Can you make the connection? This collaborative team building activity challenges groups to communicate with impact, listen actively, foster teamwork and collaboration and get engaged – quickly. Two sub-teams must work to achieve success in two separate activities; however, each team’s success is directly connected to their abilities to share their best practices with the other team. This collaborative team building activity challenges groups to not only collaborate in small groups but actively collaborate and root for other departments in their company. This giant card game has everyone on the move and communicating quickly. Incredible times are achieved as teams compete head-to-head. The challenge is doubled for a wild finish in a collaborative grand finale! This team building activity challenges groups to realize how compelling and exhilarating it can be to collaborate when given a challenging deadline. 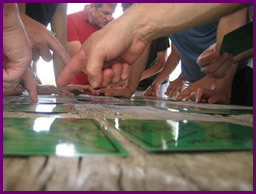 In this high-energy, collaborative team building exercise, teams are given a task with a tight deadline. They must develop and improve a solution through successive attempts. As the activity progresses, participants find that they must assign roles, clarify rules, and find ways to improve their scores repeatedly. They also learn from watching other teams, and must decide whether competition or collaboration with others will achieve their goals more effectively. At Quixote Consulting, we know how important it is for any new training knowledge to be practical and applicable. That’s why we put such great emphasis on immediate and realistic application. Participants leave with a plan in place for employing their new skills in the coming week and beyond. We also know that people respond best to presentations that are energetic, interactive and fun. There is always laughter in the session. And the unique methodologies we employ definitely help – we’ve used the modalities of chocolate and even wine pairing to explore the workshop content. Any of our fun team building programs can be easily combined with this workshop to create that magical mix of meaningful fun. Quixote Consulting’s research team gathers the latest management and leadership research and sifts through that impressive collection of knowledge and wisdom. We then distill what we’ve found into what is most important, memorable and applicable to you and your team. In short, we do the work so your people can benefit the most. Participants walk away from the session with practical understanding of how the GRPI model is a tool that can be immediately applied to their individual work situations, as well as a vision of the powerful productivity possible in a team that recognizes and leverages all team members’ strengths using the Goals Roles Process Interpersonal model. We stretch our time together (and your training dollars) by including (optional) pre-workshop assignments, post-event success tools and coaching.